Watersmeet is the perfect escape from city life and a stunning change of scenery from the beaches. It is 1.5 hours from Brisbane and less than an hour from the Sunshine Coast, and only a short drive away from Maleny and the other charming villages of the Hinterlands. It is accessible from Caloundra, Caboolture and Maroochyore airports. Take the Bruce Highway north and exit at Caboolture/Kilcoy. 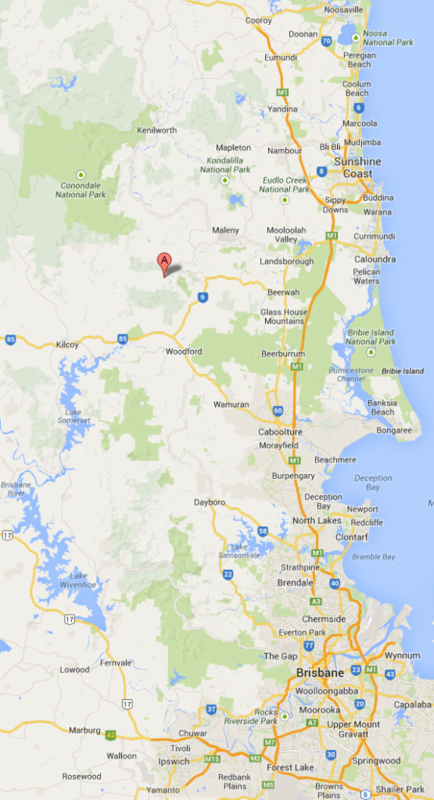 Continue on the D’aguilar Highway through Woodford and turn right into Beerwah/Kilcoy Road. Turn left onto Maleny Stanley River Road, then left again onto Mears Lane at the sign for Bellthorpe (this will become Gap Road). Follow the scenic winding road until the white gates and Watersmeet sign on your right. Take the Bruce Highway south and exit at Landsborough/Maleny. Head towards Maleny on Maleny-Landsborough Road and turn left into Mountain View Road. Follow to the end and turn left into Stanley River Rd, then right onto Mears Lane at the sign for Bellthorpe (this will become Gap Road). Follow the scenic winding road until the white gates and Watersmeet sign on your right.